We use the Internet every day for a million different reasons; to stay in touch with friends, do our jobs and so much more. Whenever you do anything online like send an email or update your social media, data is sent over your broadband connection. How quickly this data is sent is down to your bandwidth - or broadband speed - which i'll explain in more detail in this blog. To understand broadband speed, first you'll need to know about the different types of speed. Let's break them down. 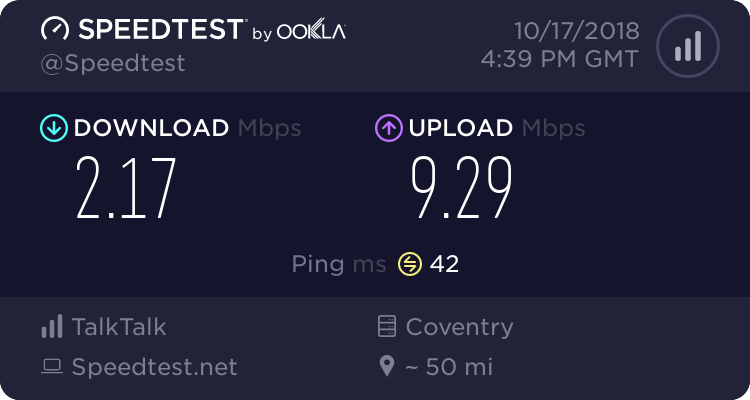 Throughput speed is how fast data is sent (uploaded) and received (downloaded) over the broadband connection in your home. It comes into play when you’re streaming films, online shopping, playing games or doing anything else that requires an Internet connection. Throughput speed can go up and down depending on the surrounding environment – but more on that later. Sync speed is how quickly the broadband connection is travelling from the local telephone exchange to your router. It runs through a network of underground cables and telephone poles and it’s always faster than throughput speed. If there’s a problem with your sync speed it will have a knock-on effect on your throughput speed. Broadband speed is digitally measured using Megabits or Megabits per second (Mbps). The more Megabits your broadband can transfer per second, the faster your connection is and the more you can do online. If you want to see how fast yours is, we have our own TalkTalk speed test you can use. The result will show your current throughput speed. We also have a guide for checking your sync speed. Now you're up to speed on *ahem* speed...let's take a look at what can put the brakes on your broadband. Throughput speed is usually affected by temporary factors and things you can change, like how many devices you've got connected at once and what you're using them for. Your total throughput speed is shared amongst all connected devices, so if you're streaming 4K videos on your phone and tablet, you might struggle to load Netflix on your laptop. Some everyday items can also interfere with your throughput speed. Electrical appliances, Bluetooth devices, mirrors, boilers and even fish tanks can all weaken your Wi-Fi signal if left unchecked. Sync speed is generally impacted by factors that are beyond our control, like bad weather. Storms, flooding and snow have all been known to damage cables and cause short circuits. That being said, setting up your router incorrectly can also cost you your speed. Plugging your router into an extension socket instead of your master socket is an easy mistake to make. The distance between your house and the telephone exchange is another factor. If you live far away from the exchange your broadband has to travel further to reach you, getting slower along the way. Telephone pole damaged by bad weather. Now you know all about broadband speed, it begs the question: how can you improve it? We've got some great articles full of tips to help you get better broadband speeds. If you use Wi-Fi, here's how to boost your Wi-Fi speed. If you prefer to connect with an Ethernet cable, we've got an article for improving your wired speed too. Broadband still not keeping up with you? you might want to consider swapping to a package that's better suited to your needs. We have some fantastic Fibre offers available at the moment, all which come with our game-changing new Wi-Fi Hub at no extra cost. This speed nerly 3 weeks now,People from chat, just write, we'll take care of it. But it takes a long time, the TV also stops. Can anyone help me, I'll take all the advice. @lorak79 If you want help and advice with your issue you should post on the community help section, this is a blog.